Relatives of Gulsen Bahadir, a victim of Tuesday's attack on Ataturk airport, mourn at her flag-draped coffin during her funeral ceremony in Istanbul, Turkey, June 29, 2016. Turkey blamed Islamic State jihadists Wednesday for the deadly assault on Istanbul's Ataturk International Airport, denouncing the latest terrorist attack in the country and vowing to fight terrorism "until the end." No one has claimed responsibility for the late Tuesday attack that killed 42 people and wounded more than 250 others when three suicide bombers opened fire with assault weapons and then blew themselves up. Prime Minister Binali Yildirim said, "The evidence points to Daesh," using an Arabic name for IS, but added that "our investigations are continuing." He suggested the attack could be connected with Ankara's move Monday to repair strained relations with Russia and Israel. Yildirim said one of the suicide bombers blew himself up outside the airport terminal, with the other two using the panic of the moment to shoot their way past security guards and set off their bombs inside the airport. Aircraft taxi at Ataturk International Airport in Istanbul, Turkey, June 29, 2016. The Turkish government declared a day of mourning Wednesday, even as work crews cleaned up the widespread debris at the airport, and flights resumed. World leaders condemned the bombings. U.S. President Barack Obama called Turkish President Recep Tayyip Erdogan to offer his condolences. Later, at a summit of North American leaders in Canada, Obama said the U.S. "will not rest until we have dismantled these networks of hate that have had an impact on the entire civilized world." Mogens Lykketoft, president of the 193-member United Nations General Assembly, said, "The international community must — through much closer cooperation — redouble efforts to contain and fight radical and violent extremism." Erdogan said the incident "shows that terrorism strikes with no regard to faith and values." But he said that his country "has the power, determination and capacity to continue the fight against terrorism until the end." The attack on the airport, Europe's third busiest, is the latest in a wave of bombings in Turkey over the past year that have killed more than 260 people. ​The terrorist attacks have decimated the country's tourist industry, cutting the number of visitors to the country that straddles Europe and Asia by 23 percent through May compared to a year ago. “Our airport has been opened to flights and departures,” Yildirim said. Turkish Airlines said it has resumed all flight operations, including flights between the U.S. and Istanbul. Officials said 13 of those killed were foreign nationals, with the remainder Turks. They said 109 of the injured were released from hospitals Wednesday, but that 41 were still in intensive care. 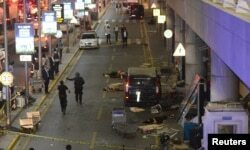 Witnesses said the suicide bombers opened fire on people before detonating explosives at the international arrival terminal. One witness described the scene to VOA's Turkish service. "There were two small explosions and then a large one. People scattered everywhere. They did not know where to go. We were waiting for my sister, but could not find her. We are [still] waiting." A second witness said, "In one direction there were shots. In another direction there were bombs, and people ran out as fast as they could, and there were people bleeding on the sidewalk." In the last year, both Ankara and Istanbul have seen scores killed in bombings carried out by both IS and Kurdish rebels.